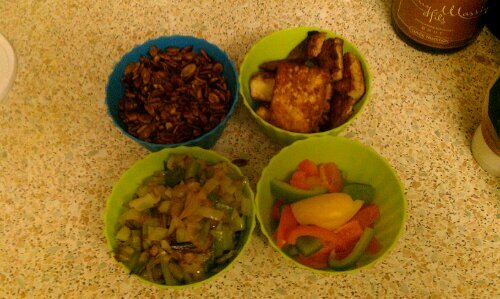 I cooked the leeks and onions in some sunflower oil for about 15 mins and while that was cooking I marinated the tofu in tamari (wheat free soya sauce), then cooked it in sunflower till golden brown. 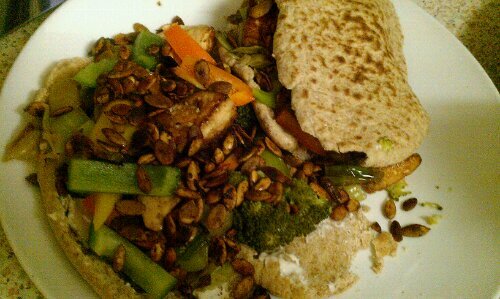 I also used some of the tamari for the pumpkin seeds. I steam the broccoli for 10 mins at the same time. 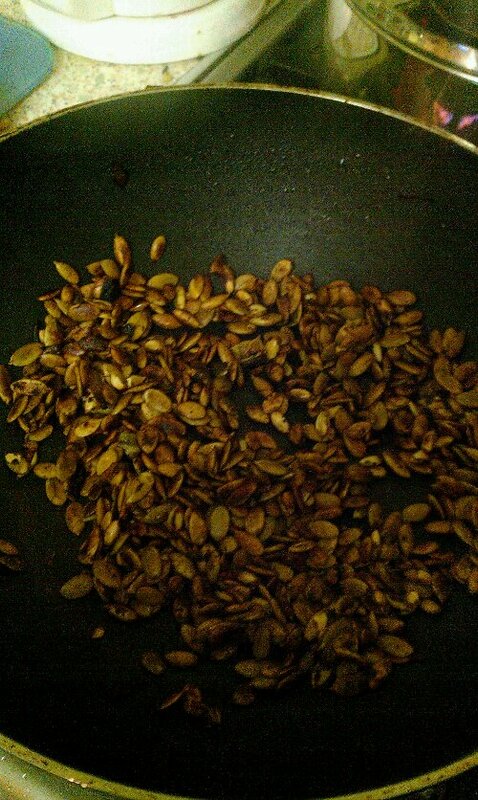 I dry roasted the pumpkin seeds in a big pan, until they started popping and going slightly brown, keep stirring them as they will burn! 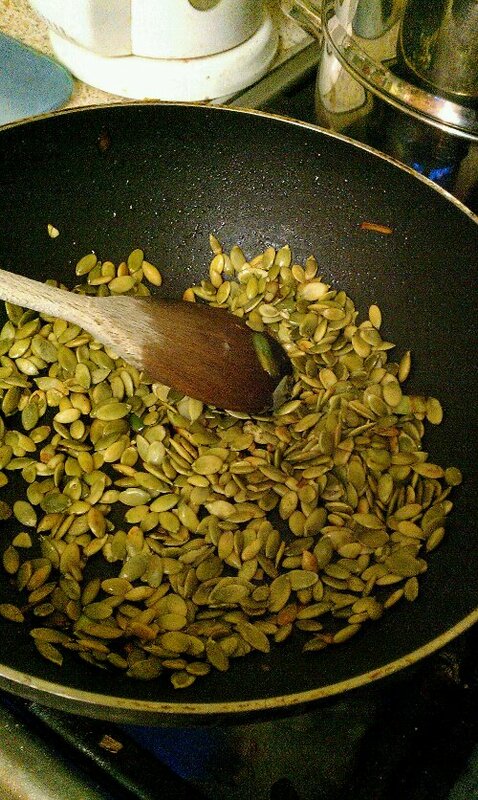 Add maybe a couple of tablespoons of tamari, for the amount of pumpkin seeds (see below) I’m not that into them plain so adding tamari to the pumpkin seeds makes them really yummy! They will soak up the tamari and keep stirring so they are fully coated. 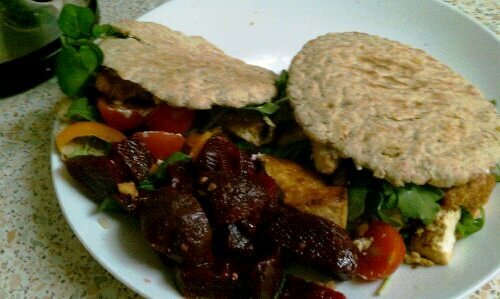 I then toast some pitta breads in the toaster, you can add any filling to spread on the pittas after they are toasted ( be careful when opening them as they trap a lot of hot steam) which burns! The fillings I use are cream cheese (vegan, various flavours – garlic, chives & herbs, plain), houmous (again various flavours, plain or with olives is my favourite), mashed up avocado/guacamole , marg/yeast flakes, vegetarian pâté and vegan mayonnaise.